What are your most basic wardrobe needs ? Long Holiday Weekend thoughts, and appropriate when the son of someone who was famously stylish is getting married today. My reactions helped me recognise my priorities, so here they are in case they help you too. Of course wardrobe planning is more effective when you know your most flattering colours and shapes. And your personal style. And the needs of your lifestyle. casual jackets such as knits, shirt jackets, shrugs, or hoodies. pullover layering tops, such as sweaters, tunics, or overblouses. protective clothes, such as aprons, coveralls. special requirements for hobbies, sports, work. Here’s a wardrobe.pdf of the list, to download and print. Add notes on the list if there are items you want to expand to make more distinctions, or garments you want to add. Cross off all the items which you never or very rarely wear. Cross them off thickly so you can’t read the words. Use the left margin to write in these numbers. Anything worn less often – mark with a 1 if it’s essential even in a minimum wardrobe. The 4, 2, 1 tell you how many of these you need, minimum. Have you got a clothes ‘signature’ – something you always wear or would like to wear ? Do you usually wear one type of garment, or perhaps one colour, or a type of fabric, or a type of trim. Or your signature might be a style element, perhaps a type of collar or pocket. If you like to wear a ‘signature’, this is the first item to pay extra attention to, and expand beyond the smallest practical number. Make sure you have an outfit for any rare event that may happen without much warning. And that’s your own personal minimum wardrobe plan, the fewest clothes to cover your needs. Have you got those numbers of items ? Are they flattering and in your style, items that you love ? Do they make outfits ? 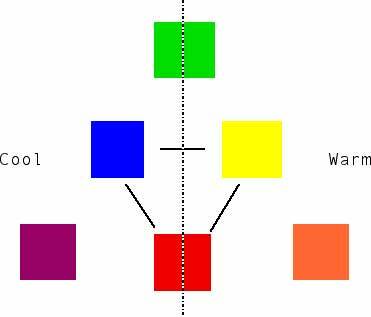 Or preferably co-ordinates – do all 4 items go with all 4 items in another group ? such as all tops go with all or most bottoms, all or most layers ? What does that tell you about your priorities for adding to your wardrobe ? What colours, fabrics, styles would be best for adding outfits ? Are they items you would enjoy sewing yourself ? Are you going to buy or sew ? For me it did make a difference to make a written version. I’m surprised how quickly it focussed attention on what I need. But I am a ‘seeing things written in front of me’ person. You might like to make separate lists for summer and winter. Or for work clothes separate from casual clothes. Or for special evenings. Or for pool/ beach. Or halve the numbers for a travel wardrobe. Um, do you need separate lists for what you actually wear now, and what you would like to wear. . . I crossed out over half the things on the list. Hmm, my favourite layering pullover tops and shirt jackets aren’t even mentioned in most wardrobe plans. At work it was always a turtle-neck cashmere sweater, or unusual blouses and watches. They don’t get much of a mention either. Everyone’s needs will be individual and special. The numbers and types of clothes you need are very different for a person who lives in tees and jeans compared to someone who moves between gym, boardroom, opera. That’s why most published wardrobe plans are disappointing. Of course it’s marvellous if we find one that works for us. But I usually feel they’re devised for someone who has a different lifestyle, different personal style, different shape, different colouring. . . Instead I’d add an essential padded vest in winter. These things are aids, not set in stone ! Do a search for ‘wardrobe basics’ to find many more possibilities. 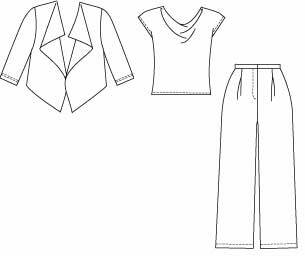 If you search for ‘wardrobe plan’ you get all the entries for all wardrobe contests at Stitchers Guild and Pattern Review – inspirational for style but not a wide range of garment types ! Have you got a ‘signature’ accessory ? How well do your accessories co-ordinate with your clothes ? can you make outfits including shoes, plus bags, scarves or whatever else you wear and carry ? Do you ever go straight from work to a dressy evening out ? You might think out accessories to achieve this, as part of your wardrobe plan. Make sure you’ve got everything you need to wear under your main outfits. Are any of your clothes transparent ? Underwear needs to co-ordinate too. What do you not mind showing ? Of course when you’re filling your wardrobe gaps, it’s best if the new items go with at least two items you’ve already got. Make sure you end up with wearable outfits. For many people, co-ordinates are better still, but often a goal to work towards rather than something achievable quickly. When you start it can be discouraging to realise how far you are from your best. Remember Princess Diana took several years to transform from frumpy to her own style. She certainly didn’t get it right every time. Have a Happy Holiday weekend getting a clear idea of what you like and need. Choose beautiful flattering patterns and fabrics and start sewing. A list of all the North American ‘independent’ pattern companies I’ve found. Except I haven’t included ones which only have 1 or 2 patterns. Or aprons, or bags, or for children, or all the patterns for historic specialists or lingerie. Or people who re-design sweat shirts. I had to stop somewhere ! I don’t think it’s humanly possible to make a complete list – companies are always coming and going. At least one has changed URL recently. And there’s one I can’t remember the name of. So if you know any I’ve left out, please tell me. The smaller European pattern companies I know of are listed in this blog right hand menu. With special thanks to other people who have made pattern link lists. One was from the ASG, another I saved 3 years ago has no name or source with it. I’ve written two previous posts on independent pattern designers. If you want patterns for historic re-enactment or cosplay, here is a place to start : Great Pattern Review, or their earlier sources of patterns. Some of us only feel happy if we can wear a structured crisp jacket with shoulder pads on even the most casual occasions. Others, me included, are miserable if we have to wear anything like a blazer, even if it contains not a smidgen of interfacing. Most people are more flexible and come somewhere between the two ! In this season when the notched collar blazer fills the fashion magazines, what can we wear instead ? All Eileen FIsher‘s jackets are current classics, so can be worn for several years. This Spring season she picked 7 jackets to emphasise. Three are notched lapel collar blazers, see my post, and 2 have a shawl collar, see my post on them. 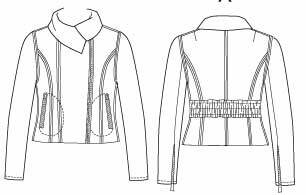 She also picked two less formal styles : a cascade jacket, and a collarless jacket with revers. And in the catalogue there are several styles with asymmetric front opening. The first issue is whether the upper edge of the cascade is short or long. Two download Shrug patterns for knits show the difference between the two front lengths, a high/ short cascade which draws the eye up, and a long cascade which draws the eye down. Sewing Workshop’s new eShrug pattern (left ) has a high cascade length. 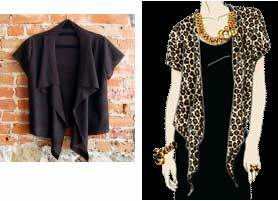 Or there’s Hot Patterns free Cascade-cozy shrug (right), with a long front. This season’s cascade jacket for wovens from Eileen Fisher has the short upper edge. Then below the short cascade, you have a choice of the lower front dropping down, as in the black shrug, or cut away as in this season’s Eileen Fisher woven version (first photo). Last summer Eileen Fisher featured a short cascade jacket with longer lower front. Here’s my post on her Summer 2010 capsule. I suggested Butterick 5472 for copying that version. The lower cut away is like some of her more structured jackets for this season, see my posts on the notched collar blazer and the shawl collar jackets. There’s a new McCall’s 6333 wardrobe pattern with a short cascade which is cut away below. Release the darts and lengthen about 4 to 8 inches / 10 to 20 cm around the bottom edge (and omit cuffs) to mimic Eileen Fisher’s version. Collarless jacket styles are more frequent in the shows and pattern catalogues this year. This one has a button at waist, and the X-shape opening, cut away below the button. Here’s a new Palmer-Pletsch pattern, McCall’s 6329. Many good opportunities for fit. Add a waist level button, and perhaps cut away below it. If you’re going to cut away, notice the X-shape is made by the fold line of the revers, not the cut edge. So there’s a curve in the pattern piece around the button area. These Eileen Fisher’s examples show much variety in style details : buttoned and zip closures, fitted or semi-fitted, narrower or wider collars. Leather asymmetric jackets with zip closure are sometimes called biker or aviator jackets. Biker style is more edgy in black with exposed zip pockets. Aviator ones have shearling lining. There are a couple of popular patterns for this style. Sandra Betzina Vogue 1198, with zip closure. 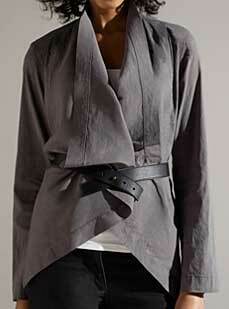 Widen the collar and use buttons instead of zip to copy some of Eileen Fisher’s style options. And Kwik Sew 3827. This has an angled front. The vest version has hidden button closure. I’ve picked out some themes, but there many other current style choices. On the Eileen Fisher site there are also trench coat, parka, zipped knit hoodie, some soft hoodie vests. So you can enjoy jackets in your own style this season. On The Shopping Forecast site (currently discontinued) the jacket styles are very limited – nearly all are notched collar blazers, with a few trench styles and jeans jackets. All current classics. If you want high fashion this summer, ironically this isn’t the time to go wild with your jacket shape (though you might want to with the colour).